Every 30 minutes someone dies from bowel cancer, making it the UK’s second biggest cancer killer. However, this shouldn’t be the case as it’s a treatable and curable disease, especially if diagnosed early. We don’t know what causes most bowel cancers, but we do know that some factors increase your risk of developing the disease. Some of these factors, such as age and genetics, cannot be changed. However, research shows that around half (54%) of all bowel cancers could be prevented by making simple changes to your diet and lifestyle. 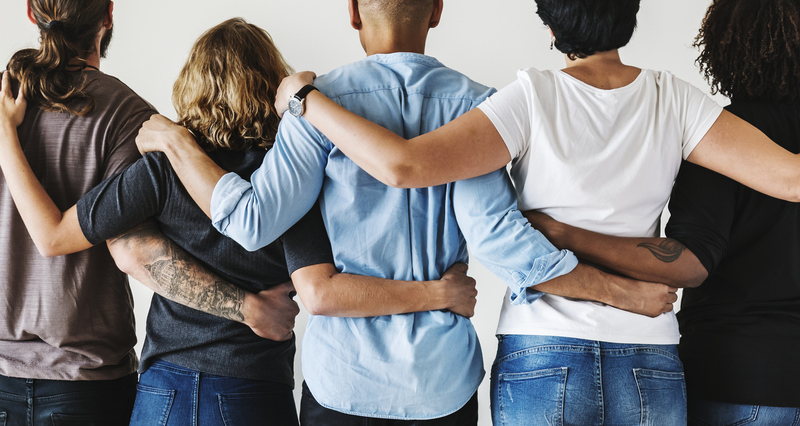 This Bowel Cancer Awareness Month, Bowel Cancer UK is encouraging people living across the country to make small changes to help stack the odds against bowel cancer and to reduce their risk of many other health conditions too. There is evidence that eating red and processed meat can increase your risk of bowel cancer. Red and processed meats include beef, lamb, pork, goat, sausages, bacon, cured meats and reformed meat products. If you eat more than 90g of red or processed meat per day, try to cut down to no more than 70g per day. 1 rasher of back bacon is about 25g, 1 sausage about 60g, one cooked medium pork chop is about 120g and a medium steak is around 115g. Fibre is an important part of a healthy diet as it aids digestion, prevents constipation and helps to reduce your risk of bowel cancer. Foods like wholegrain cereals, wholewheat pasta, oats, beans, chickpeas, and lentils are all sources of fibre. It is recommended that adults eat at least 30g every day, for example two slices of wholemeal toasted bread has 5.6g of fibre and a baked jacket potato with skins on is 4.7g. Aim to drink 6-8 glasses of fluid every day. Water, lower fat milk and sugar-free drinks including tea and coffee all count. Fruit juice and smoothies also count towards your fluid consumption, although they are a source of free sugars and so you should limit consumption to no more than a combined total of 150ml per day. Sugary drinks are one of the main contributors to excess sugar consumption amongst children and adults in the UK. Swap sugary soft drinks for diet, sugar-free or no added sugar varieties to reduce your sugar intake in a simple step. Being overweight or obese and carrying a lot of weight around your waist can increase your risk of bowel cancer. It is estimated that 11 out of 100 bowel cancers (11%) in the UK are linked to people not having a healthy body weight. Measuring your BMI (Body Mass Index) is a simple way of finding out if you’re a healthy weight for your height. You can check your BMI on the NHS website. 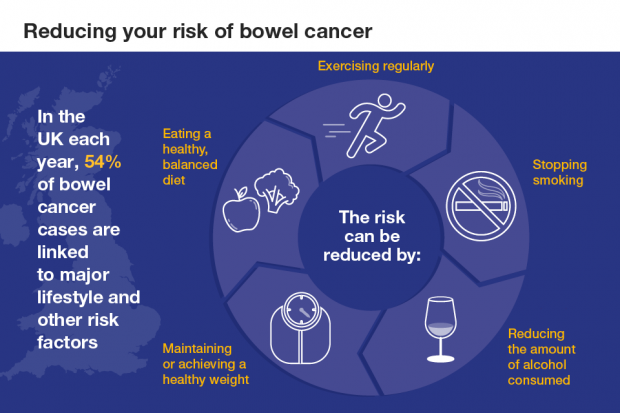 People who are more physically active have a lower risk of developing bowel cancer. Being active can help you maintain a healthy body weight and makes you feel good. The UK physical activity guidelines state that adults over the age of 19 should aim to be active daily, with activity of at least moderate intensity adding up to at least 150 minutes in bouts of 10 minutes or more over a week. One way to achieve this is to do 30 minutes of physical activity, such as brisk walking, five times a week, and as fitness improves this can be increased to 60 minutes. If you don’t do much physical activity, try starting with 10 minutes and increase the time gradually. This guidance also recommends strengthening activities on two days per week. As well as being more physically activity, adults and in particular those over 65, should minimise the amount of time spent being sedentary for extended periods. Alcohol is linked to seven types of cancer, including bowel cancer. It is estimated that about 6 out of 100 bowel cancers (6%) in the UK are linked to alcohol. The UK Chief Medical Officers (CMOs) advise that it is safest not to drink more than 14 units of alcohol a week on a regular basis. The guidelines also say that if you regularly drink as much as 14 units per week, it’s best to spread your drinking evenly over three or more days. If you wish to cut down the amount you drink, having several drink-free days a week is a good approach to achieving this. An estimated 7% of bowel cancer cases in the UK are linked to tobacco smoking, and bowel cancer risk increases with the number of cigarettes smoked per day. We know that smokers are more likely to develop non-cancerous growths in the bowel – known as polyps – which could turn into cancer if not discovered. If you want to stop smoking, you can read more about how to give up in PHE’s Health Matters edition on stopping smoking. It should not be forgotten that in addition to the six positive changes outlined above, taking up the offer of bowel screening – if you’re eligible to be screened – is very important. The NHS Bowel Cancer Screening Programme can detect bowel cancer at an early stage in people with no symptoms, when it is easier to treat and the chance of survival is greater. If you’re registered with a GP and aged 60-74, you will receive a test in the post every two years. It is a simple test that can be carried out at home in private and it comes with step by step instructions. The test looks for hidden blood in your poo, which could be an early sign of bowel cancer.